Before we get to the power rankings, let's talk about the only four-letter word you're not allowed to say at a hockey rink: Luck. Everyone stay cool, we can do this. In a Friday blog post titled "If you get emotionally invested in a playoff hockey team, you're a masochist," Washington Post columnist Dan Steinberg railed against the playoffs. Not this year's playoffs, or a particular series, but the entire concept as it exists in the modern NHL. It's all become a crapshoot, Steinberg argues, one where the actual performance of the teams involved has little to do with the outcomes. We're just watching two teams skate around for 60 minutes (or more) and waiting for a handful of lucky bounces to determine the winner, at which point we all get to work filling in narratives about grit and heart to convince ourselves that the right team won. Steinberg's argument is controversial, one that suggests that maybe we're all just wasting our time here. It's also absolutely and indisputably correct. It might be tempting to accuse Steinberg of sour grapes here. After all, he's a Capitals writer, and they're down 3-2 in their series with the Penguins. But he shows his work, and the numbers are hard to argue with. By almost any reasonable measure, the Caps outplayed the Penguins for most of Games 3 and 4. But they lost anyway. And this happens all the time in the NHL. It's not, as Steinberg makes clear, a case of a good team having a bad night, or failing to execute a game plan, or being outworked by an opponent who just wants it more. It's about one side going out and being the better team and then losing, anyway. A few weeks ago, I wrote about the NHL's era of unprecedented parity. In that post, I ended up hitting on the same metaphor that Steinberg did: It's starting to feel like we're just flipping coins here. Maybe not during the regular season, when bigger sample sizes and a wider disparity between teams result in a standings page that feels like at least a rough approximation of overall quality. But in the playoffs, with two roughly even teams facing off in a short series of low-scoring games, well... heads or tails? Let's be clear: Hockey fans, in general, hate this sort of argument. Many have a visceral reaction to the entire concept of results being anything other than earned. We've spent years being conditioned to believe that hockey is a morality play where the best man always wins, and that if a team like the Capitals keeps failing when it seems like the odds should be in their favor, it must be because they're suffering from some sort of fatal flaw. Luck? Good teams make their own luck, as the old saying goes. Of course, that old saying makes zero sense if you think about it for even a moment. So we don't. And this isn't just something that fans tell themselves—everyone from team owners to GMs to coaches buy in, and spend the offseason trying desperately to find the right mix of character and leadership that will finally make them a deserving team in the eyes of the hockey gods. The players themselves aren't even allowed to acknowledge the luck factor. And the media beat the character drum constantly, because we have to. It's our job to tell you why a team won, and these days, as often as not, we really don't have a good answer for you. So we either talk about heart and compete level, or we're left with this. It's not even a homer thing. Two years ago, while covering the Kings/Rangers final, I wrote that the Rangers were trailing the series 3-0 largely due to bad luck. That seemed like an obvious point to make—the Kings had won the first two games without holding the lead for a single second of playing time, and the Rangers had suffered a series of bad bounces that cost them critical goals. But as soon as I mentioned the L-word, the pushback from fans was immediate. And not just Kings fans—you'd expect that—but Rangers fans, too, who refused to believe their team was losing because of random chance. It was something more. It had to be. But most of the time, it just isn't. 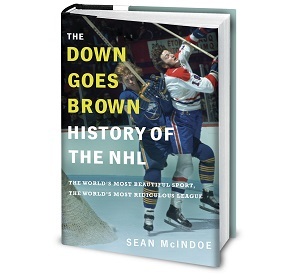 And as Steinberg writes, that leaves a hockey fan with a handful of unpalatable choices. You could stop caring, which seems logical but, let's face it, isn't going to happen. You can sit back and enjoy the show, accepting it for great entertainment even if it's all largely random; that might make you, as Steinberg concludes, a "masochist" but at least you'd occasionally be a happy one. Or you can decide that it's easier to just keep up the act, focusing on the small handful of lucky moments that seem to swing each series and convincing yourself that they really are the meaningful result of... something. Let's stick with that last option. On to the week's five best and worst, all of whom earned their way on to the list based on sheer force of will. Celebrating those who've had the best week. Boudreau was fired last week after yet another Game 7 loss, but his reputation for losing the big one didn't seem to dissuade teams from lining up to hire him. The Wild and Senators both interviewed him, with Ottawa flying him into town late in the week. Boudreau has family in Ottawa and was giving odd media interviews that all but screamed "Hire me." Even with a somewhat unexpected vacancy in Calgary opening up, by the time the weekend arrived this sure looked like the Senators' contest to lose. And then, on Saturday, they did. Boudreau chose the Wild, agreeing to a four-year contract that will pay him nearly $3 million a season. The Senators responded by hiring Guy Boucher on Sunday, which is a reasonably decent Plan B. That leaves Calgary to pick through the next tier of candidates, one that features names like Marc Crawford, Mike Yeo and even, believe it or not, Randy Carlyle. Those are (almost) all solid candidates, but none are in Boudreau's class. As for the Wild, they've still got a steep road ahead—the core is old, expensive and locked up on very long deals that may be unmovable. But with Boudreau behind the bench, they'll at least have a puncher's chance in a very tough Central. 4. Gustav Nyquist—Hey look, a Red Wing finally won something during the second round. The Senators really blew it here, not that I'm surprised because they're so good at it. They had Boudreau in their own backyard all set up to make a big splash and then they let him go without even a thank you. If Boucher was their choice all along then why did they even bother to even talk to Boudreau? The one guy that really got hosed was Luke Richardson. He was doing a great job with their farm team and at the very least should have been an assistant to Boucher. Hopefully, a smart team will take a good look at him and hire him soon. Weekend report: The Maple Leafs... win?